The Eastside Harvest House has devoted a significant part of its 1 acre lot to raised bed vegetable gardens and an adjacent fruit orchard. The design of these beds changed from 30 rectangular beds boxed in by cedar timbers to 5 terraces retained by stone walls for greater flexibility in crop arrangement. The terraces step down the 9% natural grade of the site. The dry stack stone came direct from Iron Mountain quarry in nearby Granite Falls. Besides a green thumb, the key to a successful garden is soil preparation. The landscape installer, Northwest Bloom, did a great job. Balancing cut and fill, they used lightweight equipment for the rough grading and machine tilled the dirt to a depth of 12 inches, to assure drainage. 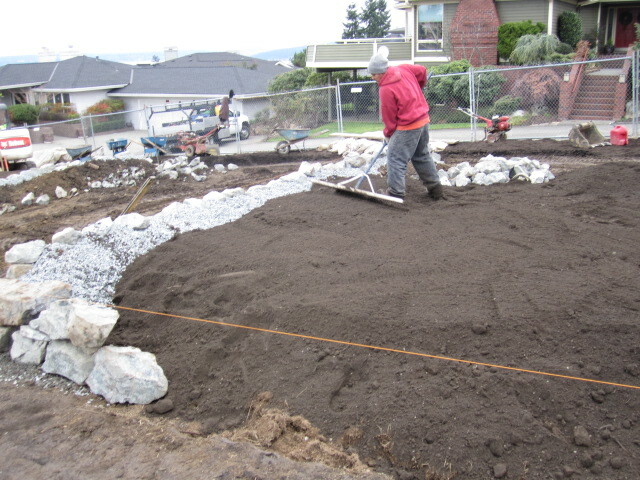 Over top an 18 inch layer of “three way” (loam, sand, compost) mix was brought in, then top dressed with a 2 inch layer of certified organic worm castings from Yelm. To protect the compost over the winter of 2011/2012, a cover crop called Austrian pea was planted and then covered with temporary plastic horticultural sheeting to prevent erosion and nutrient leaching. In a few weeks the sheeting will be removed when the cover crop gets established. Planting will take place in the spring of 2012.